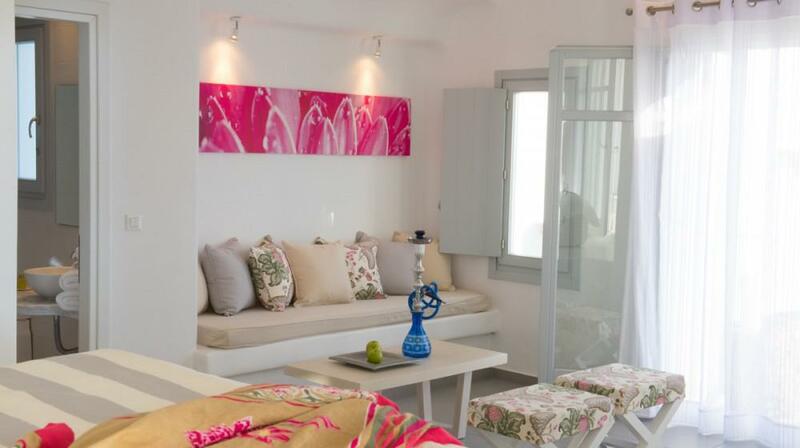 Fresh and vibrant colours decorate the Classic Mykonian rooms. 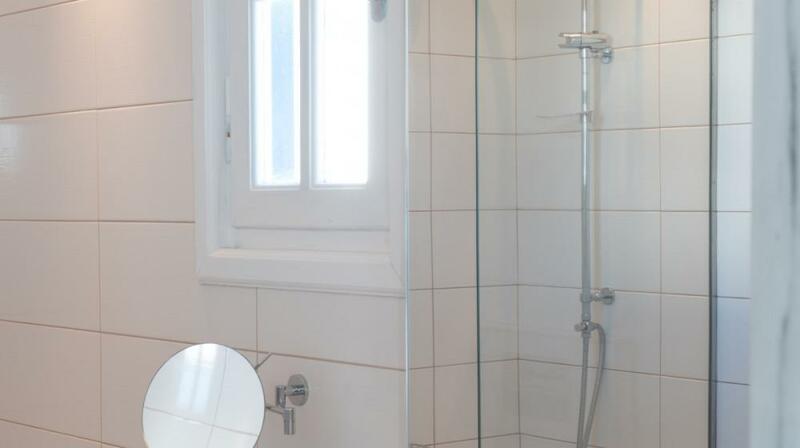 These rooms are equipped with direct dial telephones, air conditioning and heat, satellite TV, radio, mini fridge, safe and hair dryer. 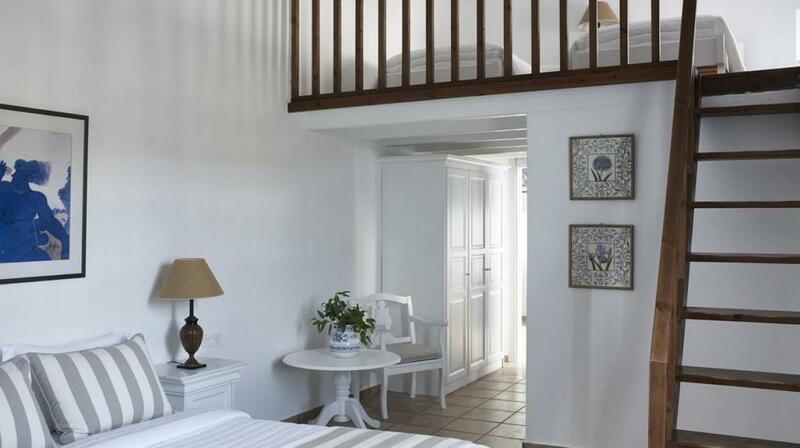 All rooms have a balcony or terrace overlooking, the mountains, or the courtyards and landscaped gardens. 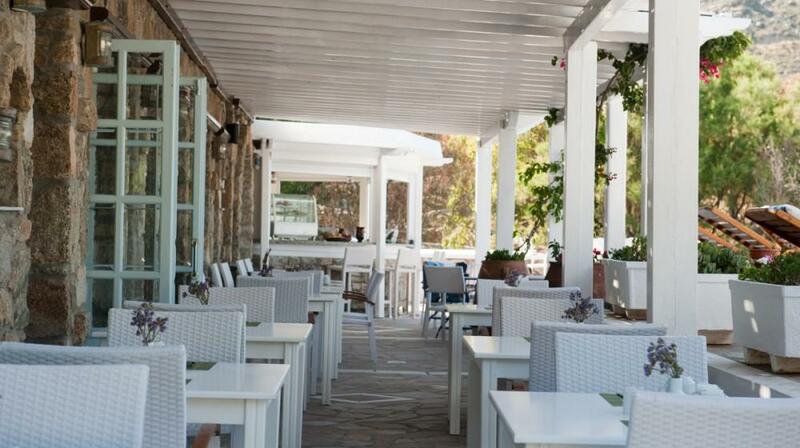 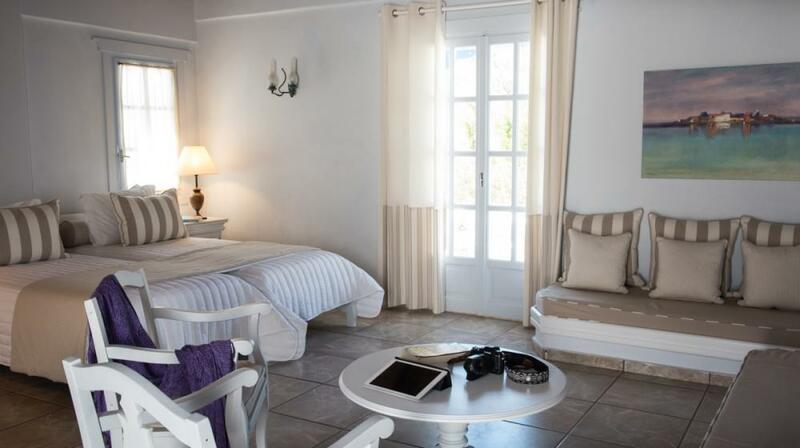 The Classic Mykonian rooms can accommodate up to three guests. 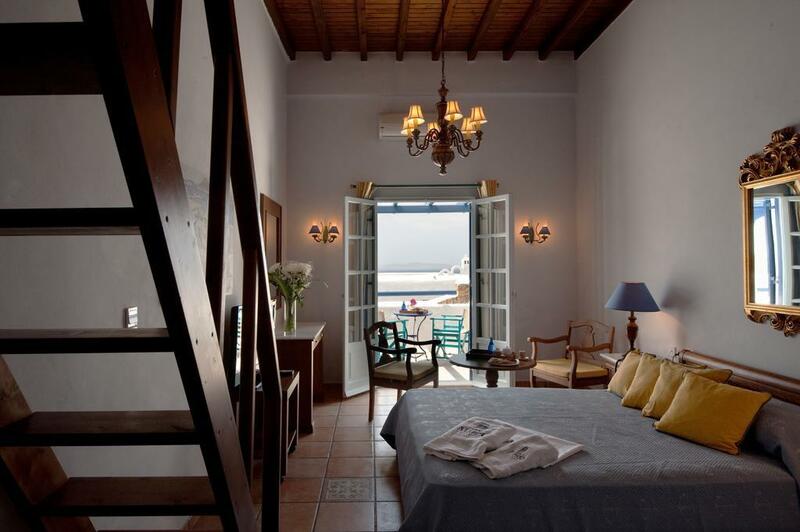 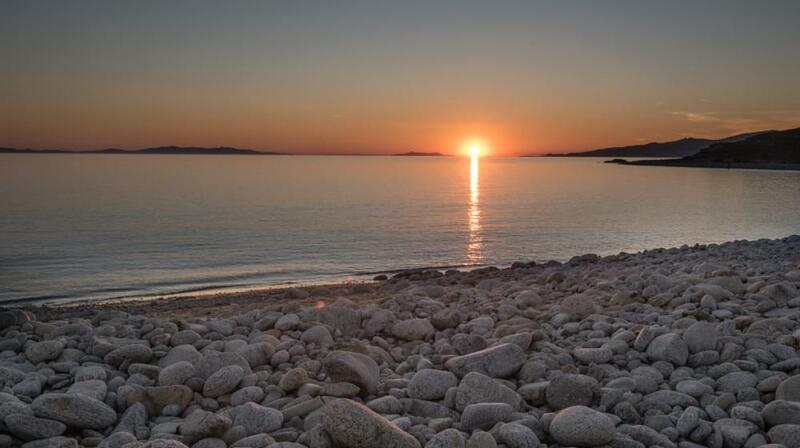 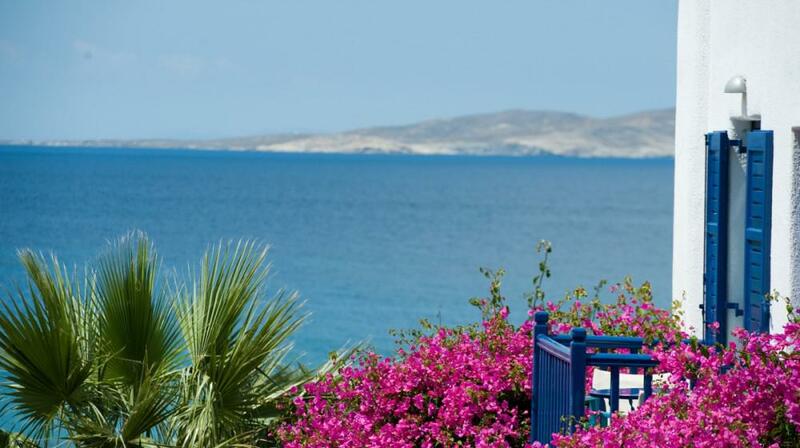 The Deluxe Mykonian rooms are larger in size than the Classic Mykonian and most offer a sea view. 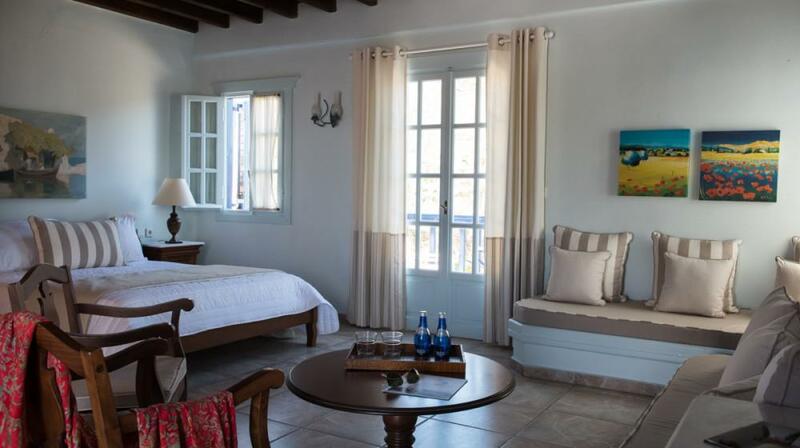 Warm Mediterranean colors in traditional island style decorate the rooms. 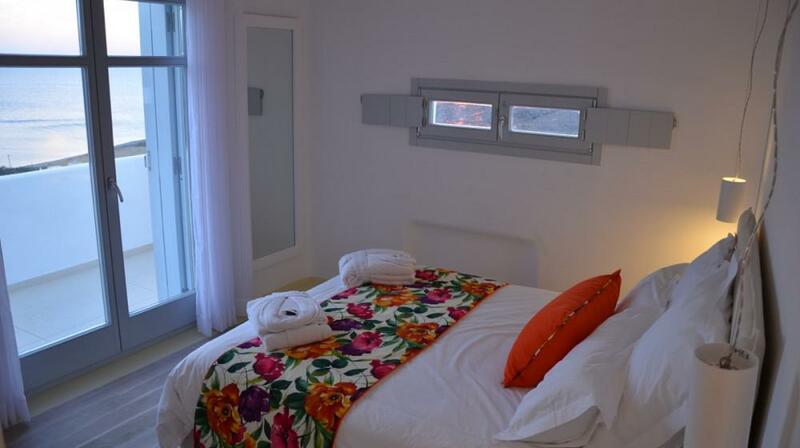 These rooms are equipped with direct dial telephones, air conditioning and heat, satellite TV, radio, mini fridge, safe and hair dryer. 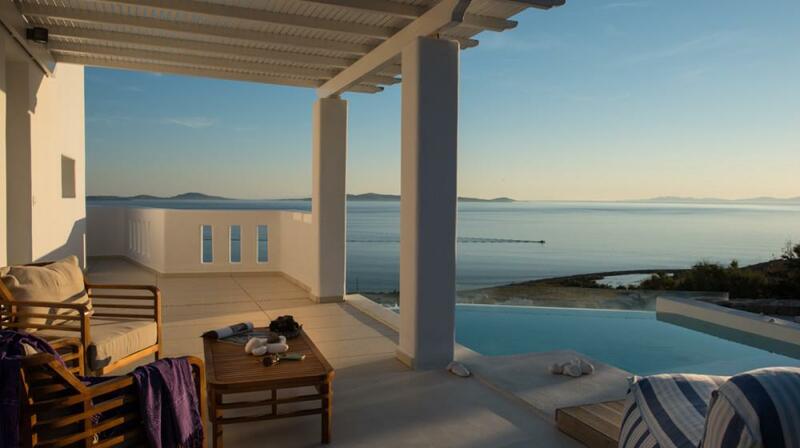 All have a balcony or terrace. 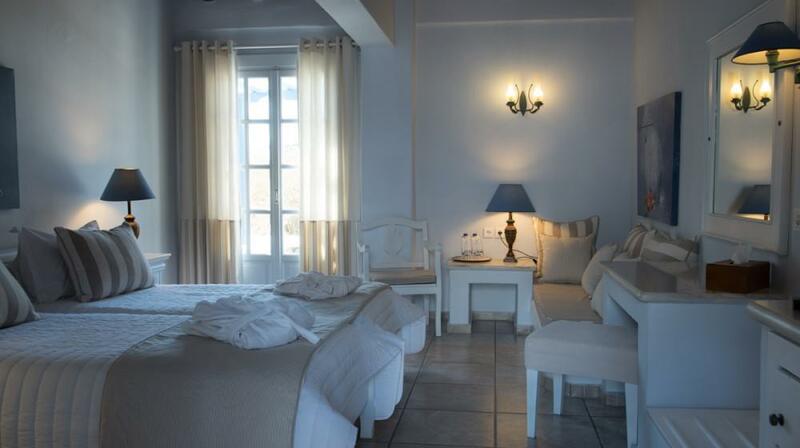 The Deluxe Mykonian rooms can accommodate up to three guests. 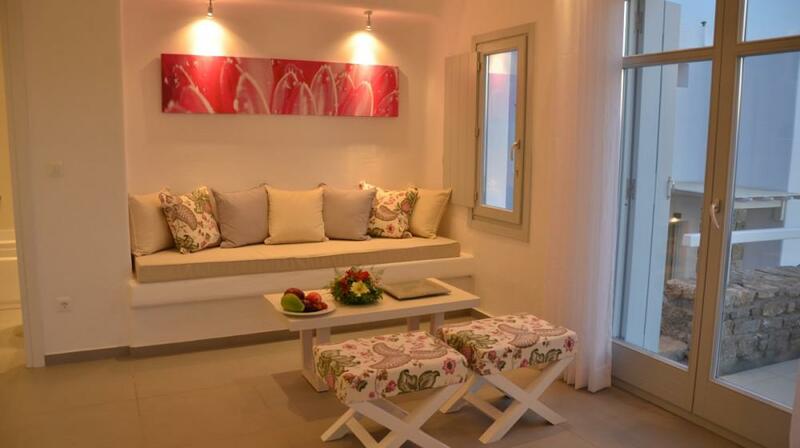 Cycladic Junior Suites are spacious and include a living room area consisting of one or two sofas that can be used for sleeping. 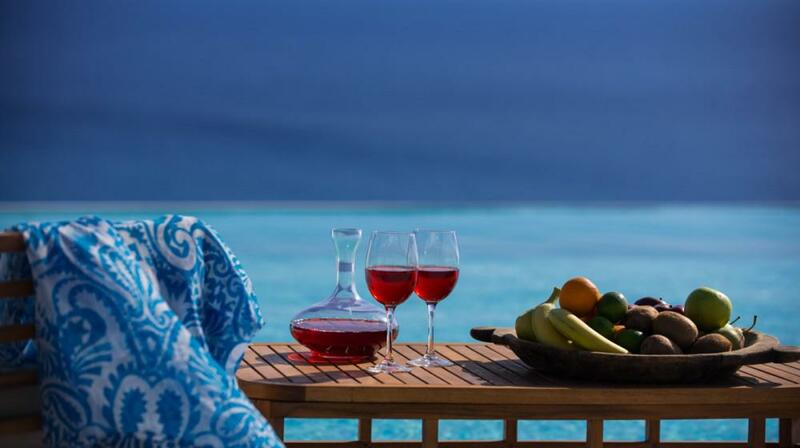 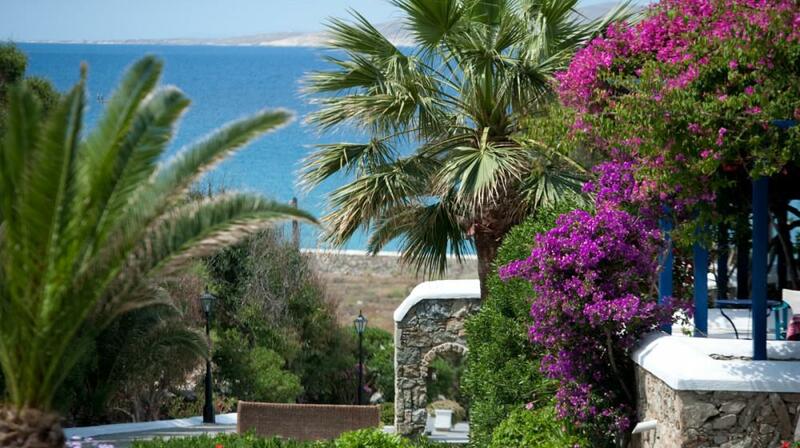 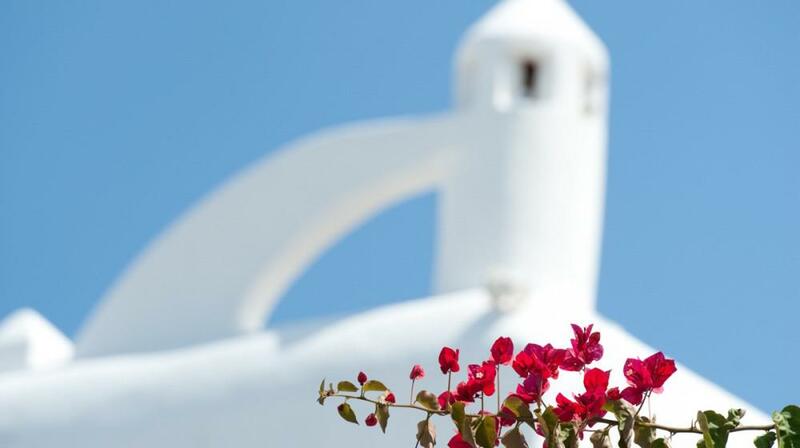 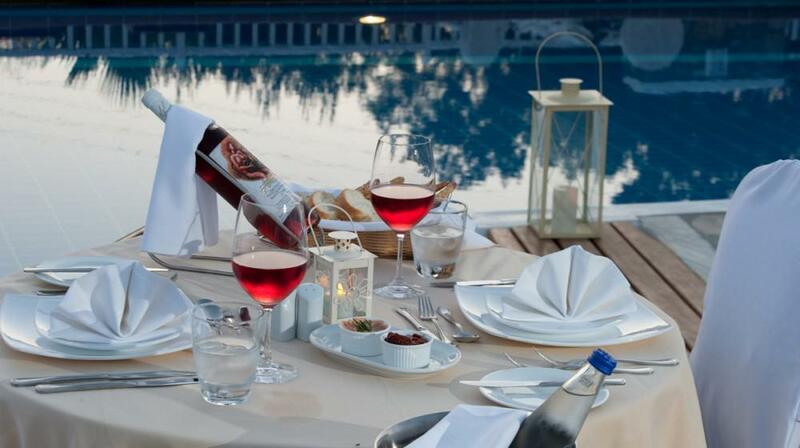 They are elegantly decorated with rich color schemes that complement the traditional Cycladic style of the Hotel. 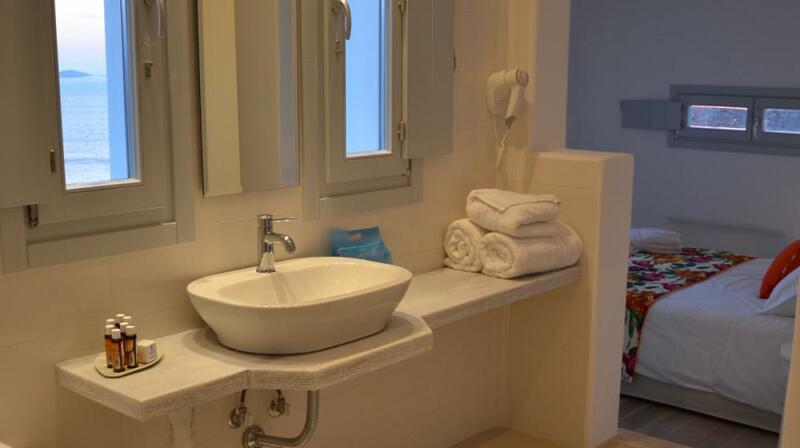 These junior suites are equipped with a flat screen TV, DVD player, direct dial telephones, air conditioning and heat, radio, mini fridge, safe, hair dryer, bathrobes and slippers. 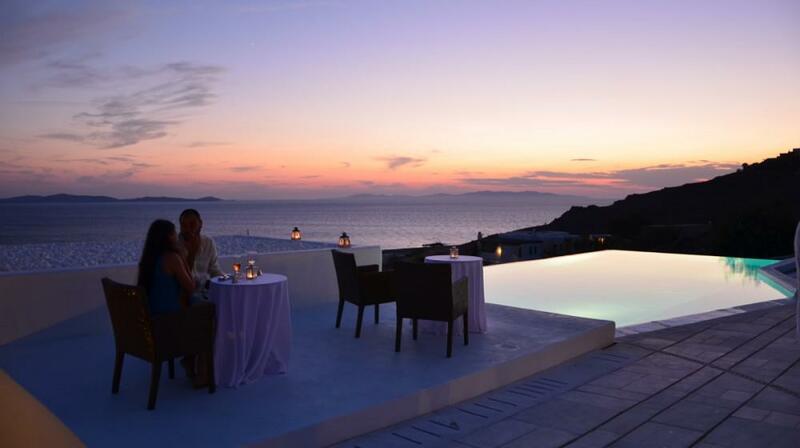 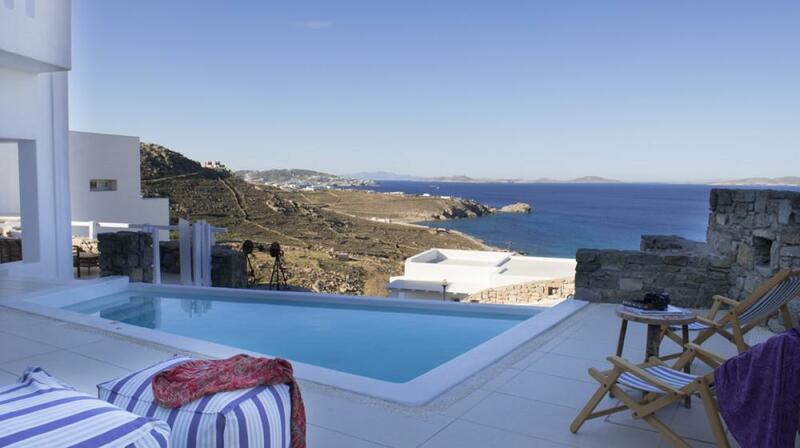 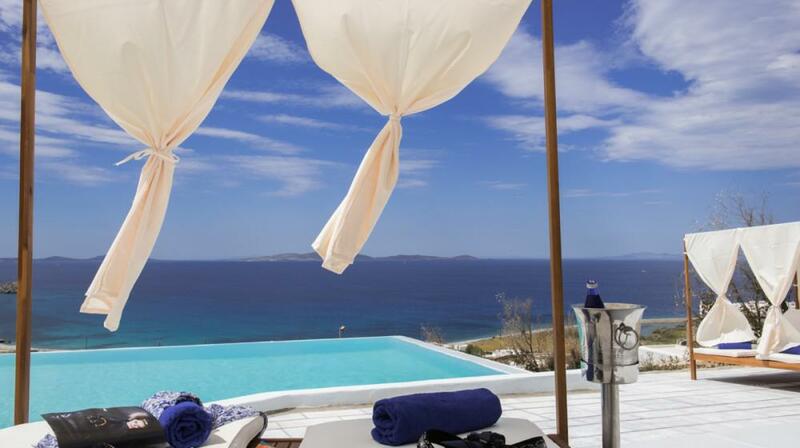 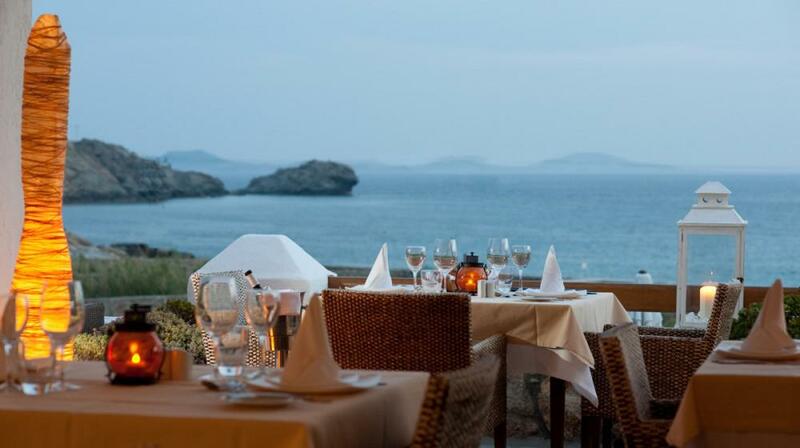 All Cycladic Junior Suites feature a balcony or terrace offering sea views. 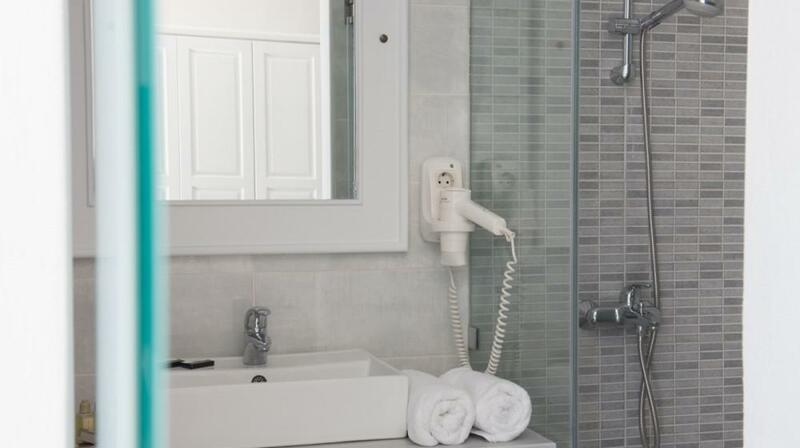 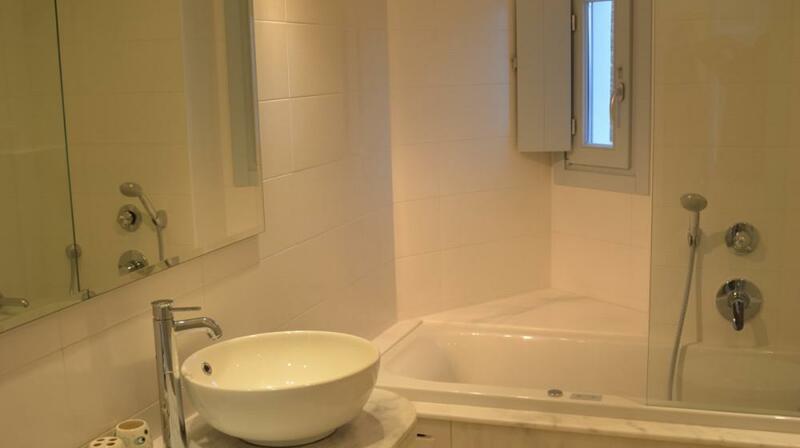 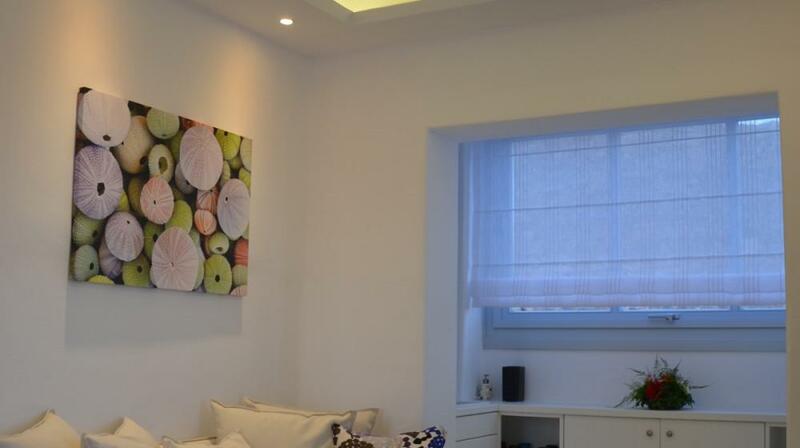 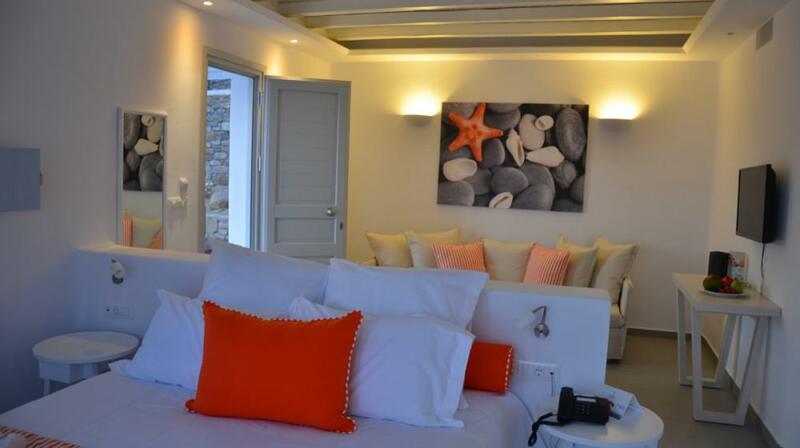 The Cycladic Junior Suites can accommodate up to four guests. 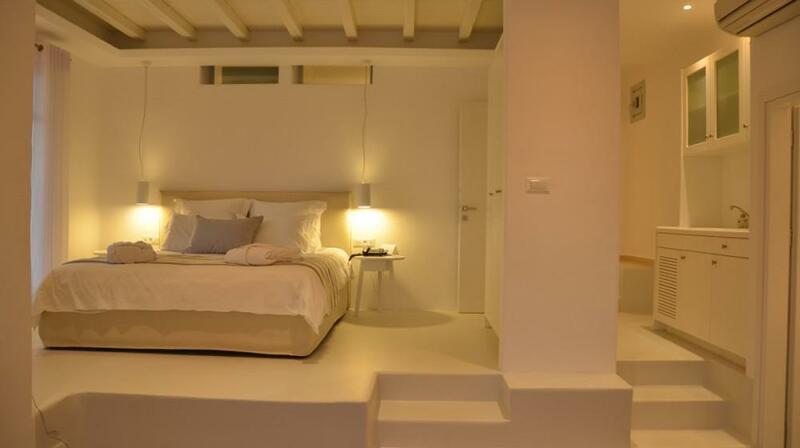 The Aegean Loft suites feature a large double room leading to an open loft with two more beds. 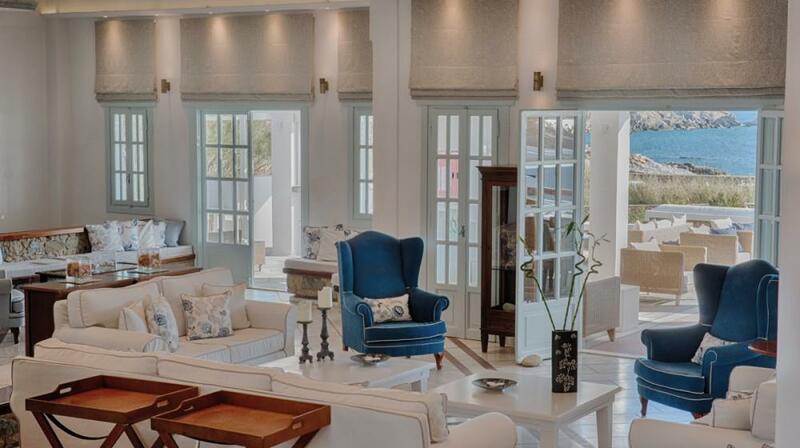 A seating area can also be found in these rooms. 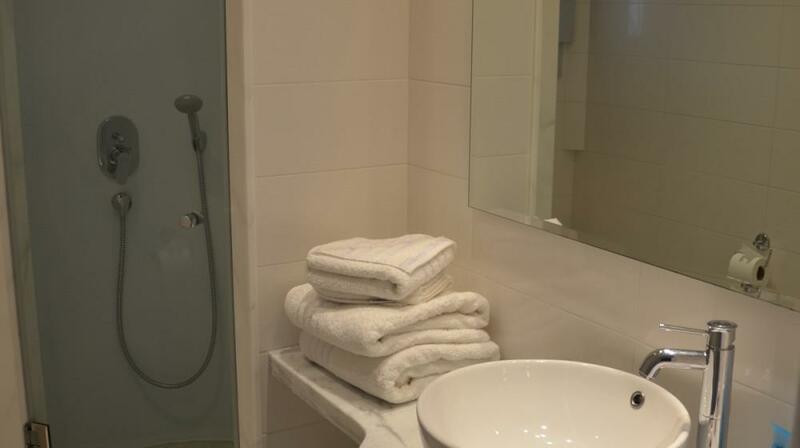 These rooms are equipped with direct dial telephones, air conditioning and heat, satellite TV, radio, mini fridge, safe and hair dryer. 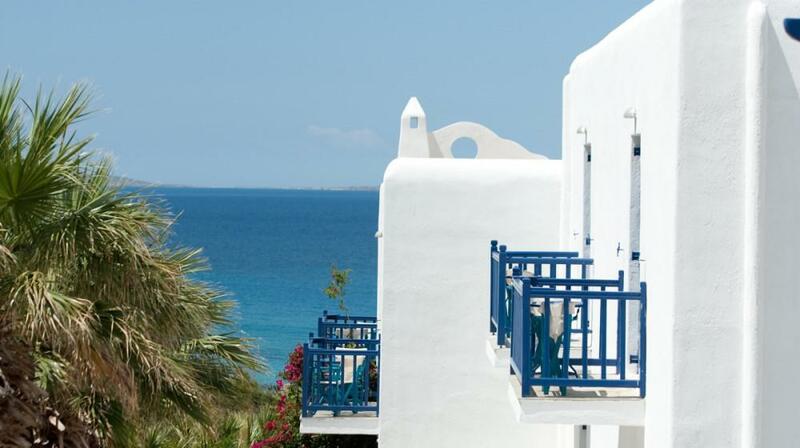 The Aegean Loft Suites are located in the fourth building, at the highest point of the hotel complex, offering a beautiful sunset sea view from the suite’s spacious private veranda. 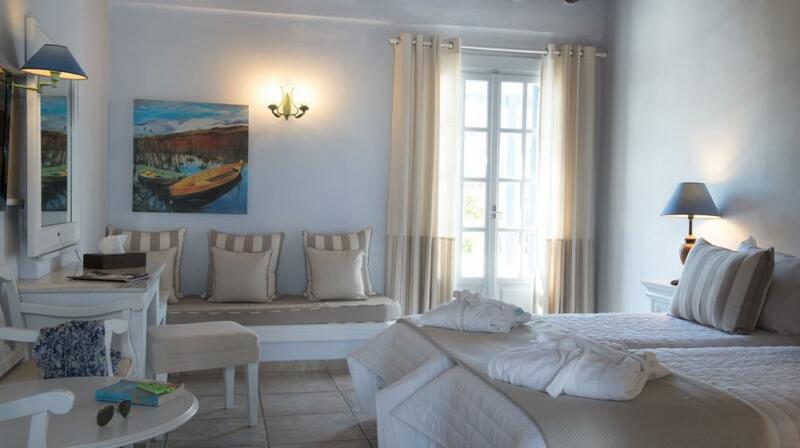 These rooms are ideal for families and can comfortably accommodate up to four guests. 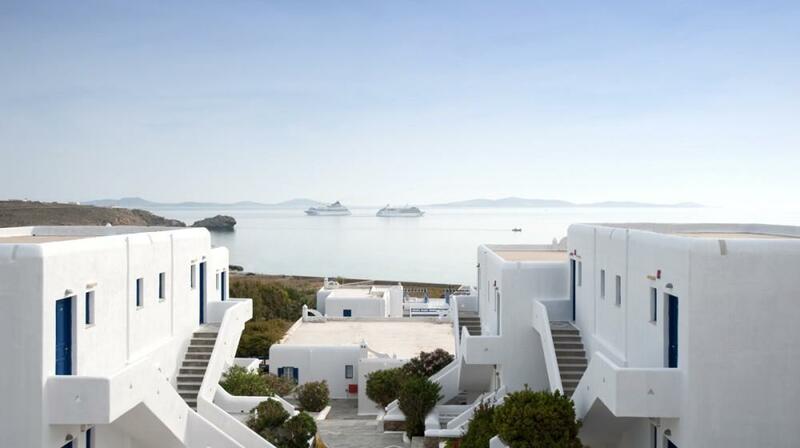 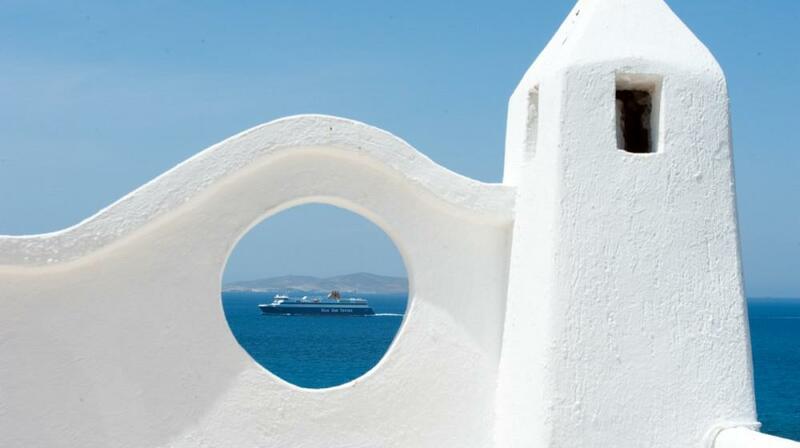 Ideally integrated within the hotel complex, Anemos Honeymoon suites in Mykonos, Houlakia, are decorated with fine Mediterranean hues and elegant furniture, such as romantic king size four poster beds and special decorative details. 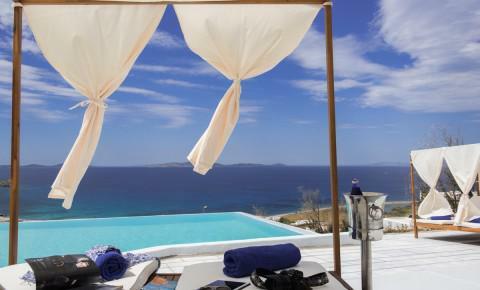 They boast interior and exterior lounges, as well as sunbeds in the private verandas, offering a magnificent view of the Aegean. 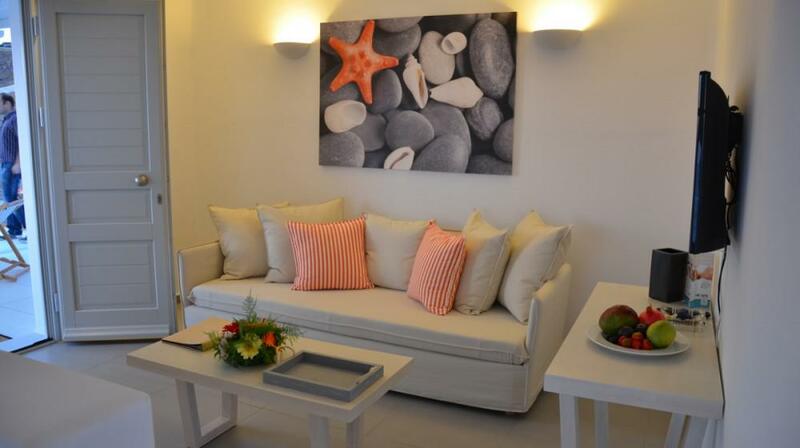 The Asteria Villa is a one bedroom open plan villa with a sitting area, bathroom and WC. 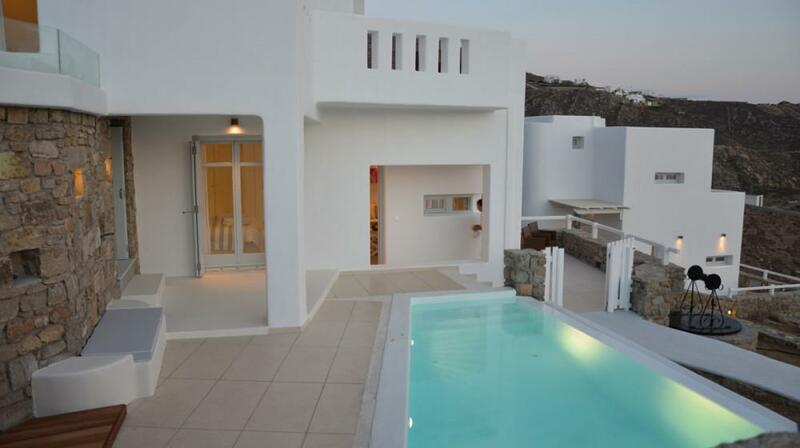 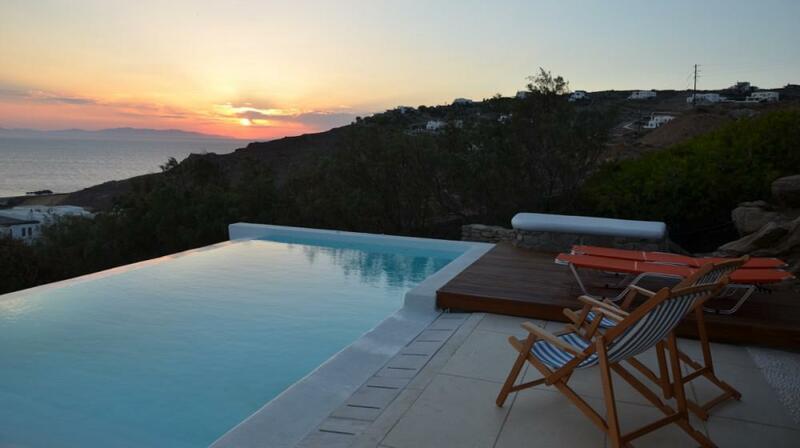 It has its own private swimming pool as well as a larger swimming pool shared with the other villas.